On May 16, 2010 Ronnie James Dio died. He was one of the most influential and beloved heavy metal singers. After he had been on the road for some years with his own band ELF, he really made a furore with guitarist Ritchie Blackmore in his new band Rainbow. In the late seventies he joined Black Sabbath. It brought him even more respect. In 1982 he started his own band DIO. Even with the death of an artist it does not stop anymore because now there is Dio Returns. Technological developments make it possible to go beyond what has so far been seen. The idea is not new. Elvis Lives in Concert is an example of this. On a screen a concert by Elvis Presley is shown while an orchestra is playing along. A hologram is another step further. Eyellusion is a company that specializes in Hologram Entertainment technology. They are responsible for the Dio hologram. There are already reports that more acts will follow in this way. Names like Frank Zappa and Roy Orbison are mentioned already. The expectation is that this is the beginning with a virtual reality technique that will be expanded and perfected. 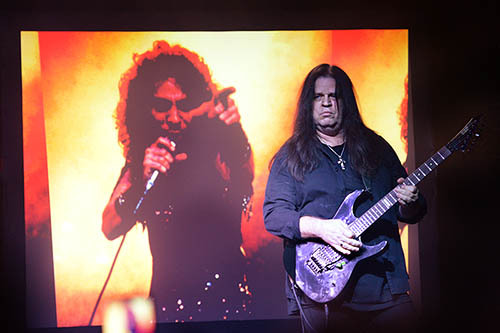 Dio Returns is the new show of the Dio Disciples, a band that was founded in 2011 by a number of former Dio members as a tribute to the deceased singer. The Dio Disciples have toured a lot in recent years and also played at major metal festivals. The band currently consists of guitarist Craig Goldy (Dio), drummer Simon Wright (Dio, AC / DC, UFO), keyboardist Scott Warren (Dio, Heaven & Hell), bassist Bjorn Englen (Yngwie Malmsteen, Quiet Riot) and two singers, Tim 'Ripper' Owens (Judas Priest, Iced Earth) and Oni Logan (Lynch Mob). The band has performed regularly in recent years. 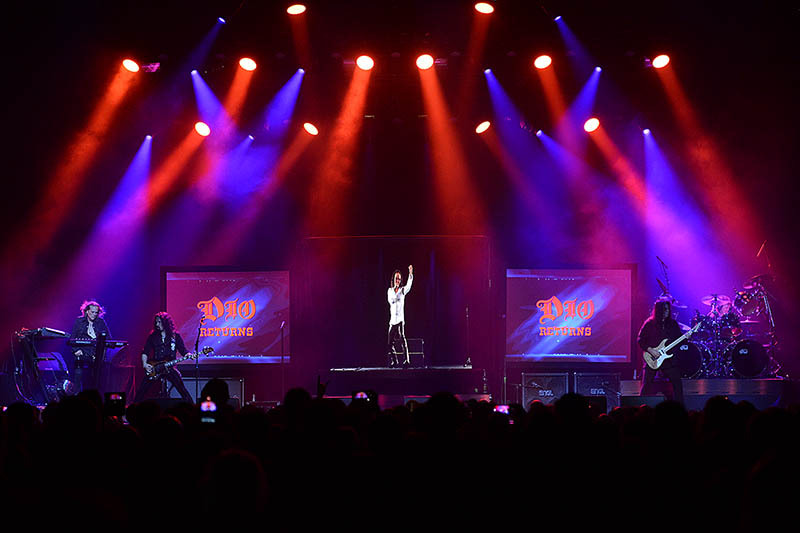 At the big Wacken Festival in Germany last year the hologram was used for the first time. The reactions ran strongly from one. Many fans are happy to see something of DIO live. Other fans consider the hologram more of a horrorgram and do not want to have any of this. The hall of 013 was well filled on Wednesday, even though the stands remained closed. There was no support act. The Dio Disciples started with "The King of Rock and Roll". The hologram was immediately visible. The vocals of Dio that came out of the speakers sounded great, but the hologram looked pretty dull, not spectacular at all. At best, it looks like a nice gimmick, but this can not replace a live singer in the slightest distance. You should see Dio Returns as a tribute to Ronnie James Dio. After all, the man can not be replaced. Certainly not by a hologram as it looks now. The Dio Disciples played many songs of well-known metal hits that Ronnie James Dio marked with his excellent voice in the past. Well-known work of Rainbow, Black Sabbath and Ronnie's own DIO was well covered. They gave us Rainbow classic songs like 'Tarot Woman', 'Catch the Rainbow' (they even could not spell that right on the screens) and 'Stargazer'. The hologram was used in a handful of songs. The other songs were sung by the two vocalists of the Dio Disciples. With the songs in which Tim 'Ripper' Owens and Oni Logan used the microphone, there was more energy. 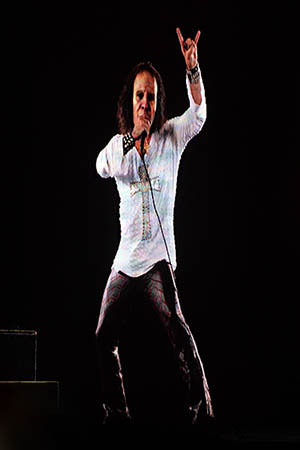 The hologram was used halfway ("The Last in Line / Holy Diver") and at the end ("Heaven and Hell / Man on the Silver Mountain") again. The songs were played very basic but musically well done. Goldy stood almost continuously with a gruffly stoic look. Wright was hidden behind his large drum set that was set up on the side. Thankfully, Owens and Logan showed more emotion. They clearly enjoyed themselves, just like bass player Englen. At the end there was only one short encore with "Rainbow in the Dark" where the hologram was shown for the last time on this evening. Thus the public was sent home after a mere 75 minutes. The reactions were very different afterwards. A lot of mixed feelings. Some did not like it at all while others expressed appreciation for what was offered.